Click on CHANGE PLAYER (A) to change the current player, delete the current player or create a new player. Click on OPTIONS (C) to change the screen resolution, sound effects volume, music volume and mouse cursor. To exit the game, click on EXIT (D). The Collector's Edition includes a Bonus Chapter not available in the regular version of the game. Click on EXTRAS (E) to view concept art, desktop wallpapers and other bonus content. 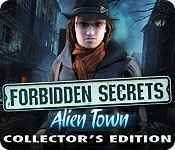 Sign-up to get informed when the Forbidden Secrets series has new game released with BD Studio Games' FREE bi-weekly newsletter.